The Grand Indian wedding season is on and Delhi's Chandni Chowk is again one stop solution for the would-be brides to buy cheaper version of their favourite bridal Lehnga's. This year they have enough options to choose from that includes Sabyasachi designed Priyanka Chopra and Deepika's Padukone's wedding collection or Manish Malhotra designed bridal wear for Isha Ambani. One news report suggests Anuskha Sharma and Sonam Kapoor's bridal lehenga's were the market callings last year. In Delhi's Gaffar Market and Linking Road, Mumbai these designs varied the range of Rs,12,000 to 1 lakh1. Delhi are not two exceptions but a stroll in Brigade Road, Bangalore and Vardaman Market in Kolkata presents us the same picture. The most coveted brands such as 'Moncler', 'Gucci' , 'Armani' 'Louis Vuitton', 'Versace', 'Hermes' 'Heron Preston', 'Kenzo' and many more might be a big deal for some but the street markets across the country are thriving on first and second copies of these names. The penetration of internet has made accessible the "duplicate goods" to consumers from every section of the society. These practices certainly questions the Indian IP enforcement mechanisms but also casts doubt over the competency of present IP laws in fashion industry as a whole. The practices of design piracy and knock offis not merely middle class chase for luxury lifestyle but the practice is prevalent among the designers themselves and thus discourages the fashion industry for 'original works'. 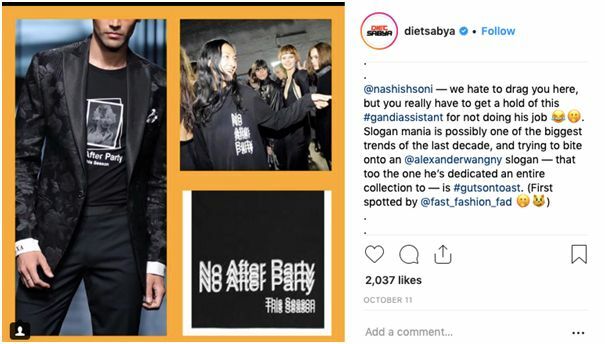 @dietsabya, an Instagram handle inspired by New York based @diet_prada, social media fashion watchdog has been incessantly working to make the public aware about the blatant plagiarism by the designers themselves, sometime from young college students and sometimes foreign designers. 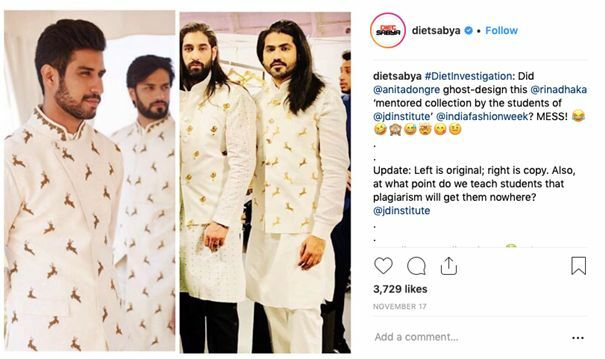 As per Diet investigations renowned fashion designer Anita Dhongre copied designs from the students of JD institute. Indian IP laws, specifically The Copyright Act,1957 and The Designs Act, 2000 gives two kinds of protection in the designer clothes . First is the protection for the drawings on any garment that may not necessarily include the shape/design of the garment itself . @dietsabya highlights this kind of copying by famous designer Nashish Soni onto Alexader Wangny's slogan. The second category includes the design/shape of the garment itself, attributing to its unique fabric and tailoring. Designers are aggressively pushing to protect their design rights of this category. Rohit Bal in 2017 became the first designer in India to get copyright over his entire collection and the spree was followed by number of other designers thereafter. It is thus more relevant today that such a huge sector is not trapped in complex web of laws functioning across domains . Currently it is majorly regulated by Intellectual Property laws – Copyright Act 1957, The Trademarks Act, 1999, Designs Act 2000, and Geographical Indications of Goods (Registration and Protection) Act, 1999, however none of the them is sufficient to deal with the sector in entirety. Before the next collection for designers is launched, one question that disturbs the designers the most is how to prevent others from copying their original work which has been produced after rigorous intellectual labour. Whether to seek copyright protection of their original work or get the design registered to ensure its full scale commercial exploitation. This designer's dilemma came to the courtroom in Ritika Private Limited v. Biba Apparels Private Limited.5 In this case, the plaintiff, a boutique apparel designer brand, brought a suit against the defendants who have been a leading name in ethnic wear, for an injunction to prevent reproduction,printing, publishing, selling or offering the prints or garments for which the plaintiff claimed to be the first owner. The legal issue raised in this case was that once the copyrighted works of the plaintiff are applied for the making of any dress, and production of that dress exceeds 50 in number, whether the plaintiff losses ownership of her copyright works . The court made a distinction between designs eligible for copyright protection under the Copyright Act, 1957 and the Designs Act,2000. It held that copyright protects the original expression of the "artistic work" and offers limited protection to the commercial exploitation of the same, whereas the Designs Act is the chief tool to protect industrial application of the design, however the design need not to be always original. The court decided the dispute in favour of the defendants and the suit thus dismissed,relying on the bar under Section 15(2) of the Copyright Act, 1957. It was also held that had the facts been different from the 'application of the designs' to 'direct lifting of the design' the answer would have also differed. Here the 'direct lifting' would mean copy pasting the copyright work from its original form. Ultimately the web of IP laws proved to be counterproductive for Ritika Private Limited. The need is being recognised globally to sync the laws relating to fashion industry and develop exclusive programs to make fashion lawyers more aware about their duties and responsibilities and bring consumer sensitization about their choices . The infamous Rana Plaza incident which killed over 1,100 garment workers in Bangladesh highlights the poor labour enforcement by the global fashion leaders such as ZARA and H&M. Thus there is a need for everyone to be aware about legal issues facing the fashion industry ranging from merchandising, distribution and franchising agreements to intellectual property and labour laws. Multiple law schools have designed their curriculum focusing to cater the needs of fashion industry these include Fordham Law School, world's first Fashion Law Institute working with the support of the Council of Fashion Designers of America and Diane von Furstenberg offering JDand LL.M programs to the students. The course includes specialty in Fashion Law and Finance and Fashion Ethics, Sustainability and Development. In India such focused opportunities are quite limited. No full time graduation program is available but IIFD, Chandigarh offers limited opportunities on Fashion Retail Law in India and Diploma in Fashion & Law. Some short term courses are also available to students by leaders in global fashion industry these include coveted program by Milano Fashion institute offering exposure to brand protection ; fashion negotiations and specific agreements for the industry ;supply chain issues ; issues related to counterfeiting & fashion forgery. One thing is clear the ad-hoc approach would serve no purpose and comprehensive and focused approach needs to be followed that cater all the interest of fashion industry in the country. We at Khurana and Khurana are standing closely with the Fashion Industry, we have a dedicated team looking after Fashion Law issues.